“Pacific Rim” may be an American movie with a Mexican director using Japanese ideas, but the accompanying video game comes direct from a Japanese company, Yuke’s Co. Ltd. Naoto Ueno, head designer of the game, took some questions over email. 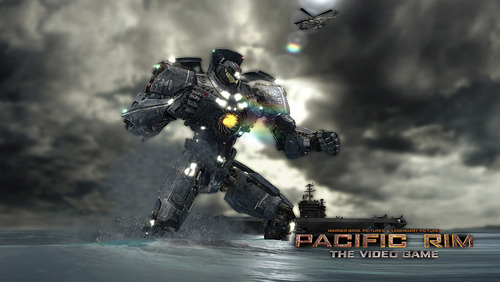 NWAW: How did your company receive the invitation to design the “Pacific Rim” video game? Ueno: When we initially heard that Pacific Rim was going to feature robots battling Kaiju, we thought that this would be the perfect project for a Japanese video game company. We spoke with Warner Bros. & Legendary about the possibility of Yuke’s making the game, which led to us presenting a game design proposal to some of the studio’s top executives. I believe us having been successful with the Real Steel game was also a key element for their interest in working with us, and us having a passion for creating high-quality games struck a chord with their passion for creating high-quality films. NWAW: How closely did you work with the creators of the film? Ueno: Guillermo del Toro is a fan of video games, and he expressed interest in taking part in the project from the design phase. It was his idea to give the Jaegers two HP gauges. He also helped us incorporate into the game some actions of Jaeger and Kaiju that don’t appear in the film and, conversely, he also put some of the moves we thought of for the game into the movie. Overall, we worked together very closely. We were so excited and moved to see how much affection he put into the game. NWAW: How will the game distinguish itself from the film? In what important ways are they different? Ueno: One obvious difference from the movie is that you can put any combination of characters together in a fight. In the movie, Gipsy Danger takes down Knifehead — but what would have happened if Crimson Typhoon had been deployed? Battles unfold differently depending on the opponent and location. One of the joys of the game is that you have the ability to play battles that didn’t take place in the movie. The game requires you to analyze the unique strengths and weaknesses of each character to build a battle strategy. Another huge difference is the fact that you can create your own custom Jaegers. Plus I’m sure anyone who watches the film will wonder what it would be like to pilot a Jaeger. NWAW: How long has the game been in development, and when will it be released in America? Ueno: We began designing the game and secured a team in June 2012, but actual development work didn’t start until autumn, so I’d say around seven months. The Xbox360 version will be released on July 12, the same day as the film. NWAW: What were the primary challenges of designing the game, and how did the company design team meet them? Ueno: I’d like to say that working on the Pacific Rim game was so much fun that nothing came as a challenge … but of course, there were many. I guess the first thing is that each Jaeger and Kaiju is completely distinct, and we needed to build several intricate systems to be able to recreate all of their unique actions in the game, and to ensure the characters could function and interact naturally. It felt so good when we built in the flying capability for Otachi — but then we realized Cherno Alpha (whose arms are small) could no longer hit him, and were at a loss as to what to do. In situations like these, instead of making Otachi weaker or reducing his flight speed, we decided to just make Cherno Alpha stronger. Instead of gradually weakening characters that were too strong, we had it in our minds to make any character that was too weak stronger. I can’t tell you how many calories from chocolates and snacks were consumed in our attempts at overcoming these challenges. NWAW: If a sequel to the movie comes around, will a sequel to the game follow?